All perennial weeds can be troublesome, however “deep-rooted”, creeping perennial broadleaf weeds such as field bindweed, hemp dogbane, horsenettle, and common milkweed are among the most difficult to control. Like annual and biennial weeds, these perennials reproduce by forming seed. In addition, they spread by rhizomes (underground stems). Buds or growing points are found all along these underground stems. Effective control programs must control newly germinated seedlings and minimize the ability of these underground buds to produce new above ground shoots. Between-cropping applications of translocated herbicides during late summer or early fall have proven more effective than other programs for control or suppression of these perennial broadleaf weeds. Rhizomes are the key to the survival of these perennial broadleaf weeds since they serve as a storehouse for food reserves (carbohydrates). It is these food reserves that allow these plants to survive winter. In the spring these creeping perennials draw on these reserves to make new growth. During this period of vegetative growth, carbohydrate movement is mainly upward in the plants. 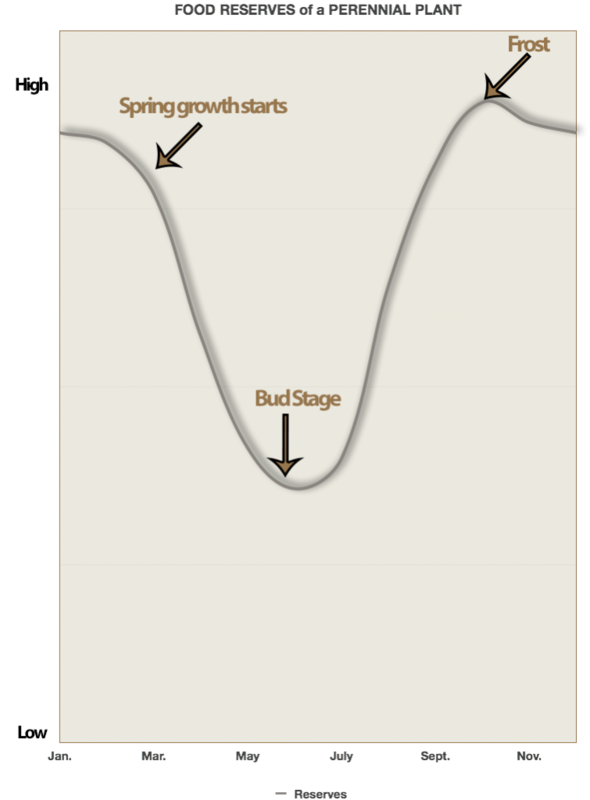 The depletion of food reserves continues until the plants reach full leaf development and flower bud formation in mid- to late summer as shown in the accompanying figure. At this time, these plants have the maximum leaf area and the lowest level of carbohydrate reserves that they will have all season. After flowering, they start moving carbohydrates from the leaves into the rhizomes in preparation for winter. Effective chemical control of established patches of these perennial weeds takes advantage of this food storage period to move translocated herbicides down to the underground buds or growing points. Translocated herbicides are the key to chemical control of “deep-rooted” perennial broadleaf weeds. Translocation refers to the movement of substances from one place to another, such as the movement of herbicides in plants. Herbicide movement in plants may follow the pathway of sugars formed during photosynthesis and/or the pathway of water that us absorbed by plant roots. Perennial weed control is most dependent on herbicide movement with the manufactured sugars. These sugars move out of the leaves to areas of rapid growth (growing points). Herbicide translocation to the growing points on the underground stems is most rapid and most effective when large amounts of sugars are being moved to the rhizomes. This usually occurs after full bloom in late summer and fall. Since 2,4-D, dicamba (Banvel, Clarity, etc.) and glyphosate (Roundup, etc.) are readily translocated from leaves into underground structures of perennial weeds, these herbicides can be effective in controlling or suppressing these weeds. Between-cropping herbicide applications are simply those that are made: 1) after harvesting one crop, 2) before killing frost, and 3) before planting the next crop. 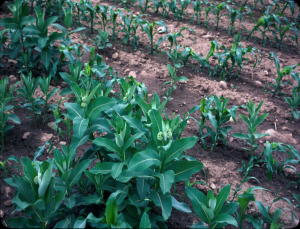 Situations that meet these requirements include fields where small grains (not seeded to legumes) or certain vegetable crops (peas, early sweet corn, etc.) have recently been harvested, and where the next crop won’t be planted until fall (small grains) or until the next spring. These between-cropping situations provide the opportunity to use non-selective herbicides such as glyphosate or to use high rates of 2,4-D or dicamba that cannot be used safely when crops are present. These herbicides should be applied when the weeds are actively growing. It may be necessary to allow the weeds to recover from damage done during crop harvest. Herbicide labels should be consulted to determine application rates for the targeted perennial broadleaf weeds. In all cases, tillage and other operations should be delayed for 7 or more days following application to allow time for herbicide translocation to the underground buds. Glyphosate is inactivated upon contact with the soil so a variety of crops can be planted following the 7-day waiting period. Since dicamba, the active ingredient in Banvel, Clarity, and numerous other products, has residual soil activity, rotational guidelines must be followed to avoid injuring subsequent crops. 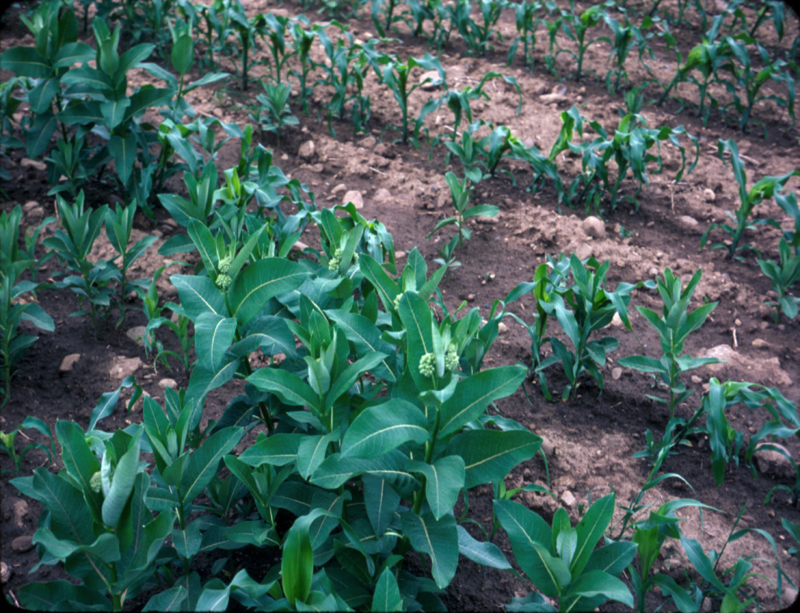 Corn, soybeans, and all other crops grown in areas with 30 inches or more of annual rainfall may be planted 120 days after application of up to 4 pints/acre of dicamba products like Banvel and Clarity. Small grains may be planted if the interval between dicamba application and planting is 20 to 30 days (depends on which product is applied) per 1 pint/acre east of the Mississippi River. These waiting periods should exclude days when the ground is frozen. The waiting period for planting winter wheat or barley following late summer dicamba applications can be shortened by applying reduced dicamba rates in tank mixes with glyphosate or 2,4-D.
Between-cropping applications of translocated herbicides provide the best opportunity to suppress or control “deep-rooted” perennial broadleaf weeds, however, growers must act now to take advantage of existing situations or to plan a rotation that will allow such applications next year. Unfortunately, the typical dairy rotation of corn and perennial forages doesn’t provide good opportunities for these between-cropping herbicide applications.